You see, talking about the future is way too hard sometimes, so let’s rather have a quick look back on what we did last week! 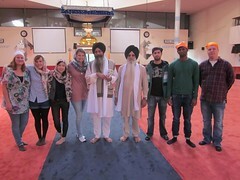 Sunday was filled with unexpected experiences when we entered a Sikh Temple as total noobs and then ended up immersing ourselves into this fascinating culture: Covered our hair, took our shoes off, sacrificed a quarter at the altar-like center of the prayer room and had some spicy Indian food for lunch together with the Sikh community. What a special thing to do in Canada! 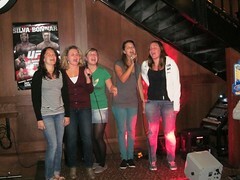 Another highlight was the Karaoke night at Toby’s Pub & Grill on Commercial Drive. Some amazing and definitely a lot of horrible singing happened that night but nevertheless, we were happy to see some many new people as part of the INTERNeX crew!! I can’t wait for all the cool things we have planned for you in October and November! Especially the Thanksgiving dinner, our trip to Whistler, the Halloween party and the Rockies trip in November will for sure be some more days to remember. Do you ever wish you had a car for just an hour, either to pick up a piece of furniture you bought at IKEA, or to get a huge grocery haul from the discount supermarket that is too far for walking distance? Or maybe you want to take a weekend road trip to Whistler or Seattle? This is where this week’s Smart Saver will come in very handy for you! 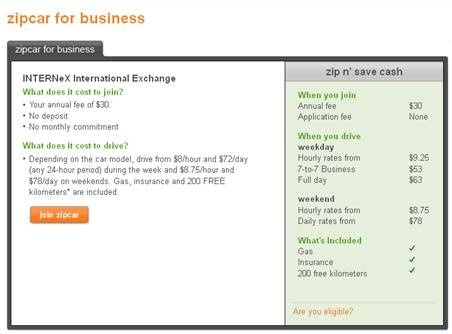 INTERNeX has just partnered up with a company called Zipcar and if you haven’t heard of them before, I am sure you are going to be very interested in what they have to offer. Zipcar is a car sharing company that has vehicles all throughout Vancouver for any of their members to use at any time on any day. All you have to do is go online or use your IPhone or Android and look up where the closest Zipcar pod is to your current location. From there you can reserve or book a car by the hour, the whole day or even longer! Once you are a Zipcar member, you have access to every single car in their fleet, and the rates start at $8/hr for a car rental. How cheap is that?? But that’s not even the best part, when you rent a Zipcar you are not responsible for any fuel or insurance costs and you get 200km free which each reservation. So if you want a hybrid car for an hour, all you’re going to pay is $8.00 and that’s it! Then you are all set to go ahead and sign up online. **Please note that this offer may not be available forever so don’t miss out on your chance to drive a Zipcar! 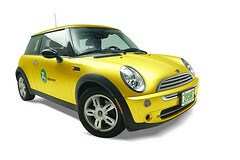 This means that you will have $30 worth of driving credit to use on any Zipcar of your choice. So your $30 credit is basically paying itself towards the first year membership free. Think of all the opportunities… Road Trips, blasting tunes and making pit-stops along the way wherever you like. OH THE FREEDOM! 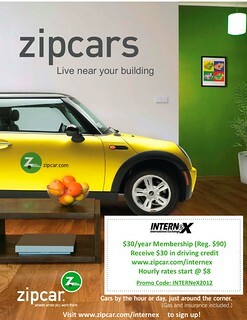 If you have any questions about Zipcar, or the special offer being offered to INTERNeX candidates please feel free to visit their website or send the PR team an email. If you have questions specific to signing up for a membership send Zipcar an email and they will happily help you out with the process. It is time for our weekly casual Friday posts! As I’m sure not a lot of you will know, February is National Black History Month. This is celebrated every year in America and Canada; and in the UK in October. This remembrance month was set up in 1926, but was originally just for the second week of February. As the more people started to get involved it was decided that the whole month would be dedicated to it. The main idea behind this month is to celebrate and remember the rich African and Caribbean History and iconic members of society that have had an influence on black history. During this month a diverse selection of events are going on in Vancouver, so be sure to keep an eye out for posters and such around the city. Click here for more information about the events mentioned above. Enrich your knowledge of Black History and visit one of these events; it’s always a great way to meet new people as well! I was reading the newspaper today that the website Megaupload has been shut down by the U.S. government. MegaUpload is one of the world largest file-sharing site and several company executives where arrested on piracy charges. I feel that this will be just one of the first websites this is going happen to, and even more are coming unless we really protest and make sure the government does not inhabits us in our internet usage or threaten our prosperity, online security, and freedom of expression. The SOPA & PIPA are just two of the bills racing through the American congress right now, but stay vigilant!! Protest by clicking HERE !!!! Watch the cards trick and listen to the story!!! This week’s picture of the week was taking in the Fraser Canyon around 3 hours northeast of Vancouver. In the picture you can see Lucas, Matteus, Patrick and me, George one of the great PR interns working at INTERNeX. 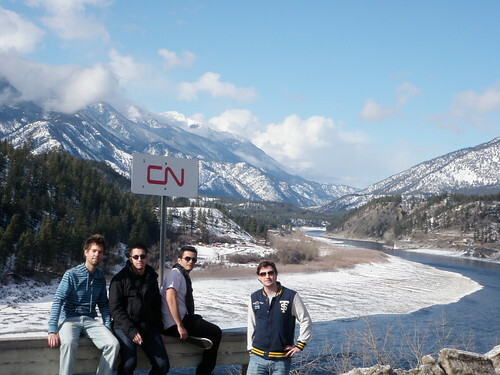 The four of us rented a car and went on a weekend roadtrip through the diverse inland of BC. We cruised through narrow canyons, wide countryside, snowy mountains, dry plateaus and stopped at the most incredible scenic spots on our way. We went ice-fishing on lake Wood north of Kelowna and met a lot of amazing and very friendly Canadians. Canada is incredible – in all kind of ways!!! In case you experienced such a great trip or want to share a story with a great picture of yourself, your friends or you just took a picture of the beautiful countryside Canada has to offer: send an email to PR@internexcanada.com! You picture might be the next picture of the week! A daytrip into the nature! Vancouver’s last “Must See Spot” is an attraction for all outdoor fans which like to immerge in the nature around Vancouver and who want to experience the freedom Canada has to offer. 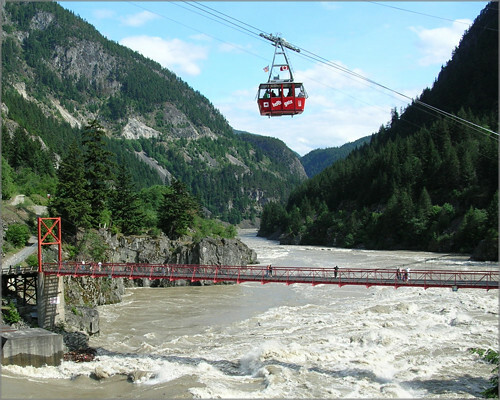 I am talking about the Hell’s Gate Airtram in the scenic Fraser Canyon. The Fraser Canyon is located in the heart of British Columbia and is accessible through a scenic route through the B.C. Mountains and 7 huge mountain tunnels. Already the drive to the Canyon itself is a great adventure. Several different landscapes and a vivid wildlife can be found and experienced on your way to Hell’s Gate Airtram. The air tram itself goes up 160 meters in height. The distance the tram is traveling from the rim of the Canyon to the upper mountain amounts to 300 meters. Once you arrived at the top rim of the Canyon, at the observation deck, you will have an amazing view all over the Canyon and the masses of water that are floating down the Canyon! Additional facilities and activities at the Hell’s Gate Air tram are Gold Panning, a suspension bridge, the Gold Panner Gift Shop and a nice little restaurant where you are able to eat some tasty food for a reasonable price! It is advisable to schedule a whole day for the trip to Fraser Canyon. Start your trip relaxed in having some stops on your way to Fraser Canyon to enjoy the beauty of BC’s nature. The Airtram is located 2,5 hours in the east of Vancouver. Take the #1 Highway and take the exit 170 at Hope! 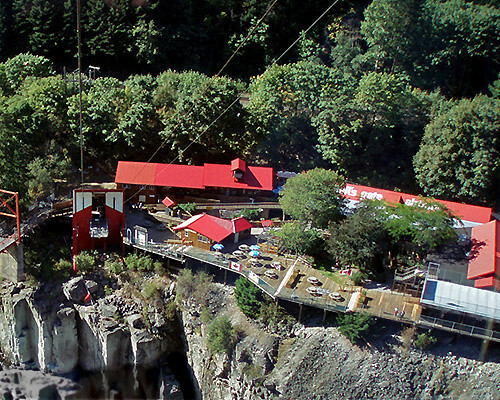 Hell’s Gate Airtram is open daily from Mid – April to Mid – October.